A “spiritual oasis” in the heart of Sydney since 1844. Under the care of the Marist Fathers (Society of Mary) since 1868, St Patrick’s Parish in Grosvenor Street, The Rocks, and St Brigid’s in Kent Street, Millers Point, continues to serve the multinational community of Sydney and beyond. At the beginning of 2017, Michael Whelan SM, Parish Priest, commissioned an icon of St Dimpna who is the patron saint of people in mental and emotional distress – especially those who have been sexually abused. Her feast day is May 15. The icon will form the focus of an annual devotion to St Dimpna each May, with prayers especially for those who are in distress as a result of sexual abuse. 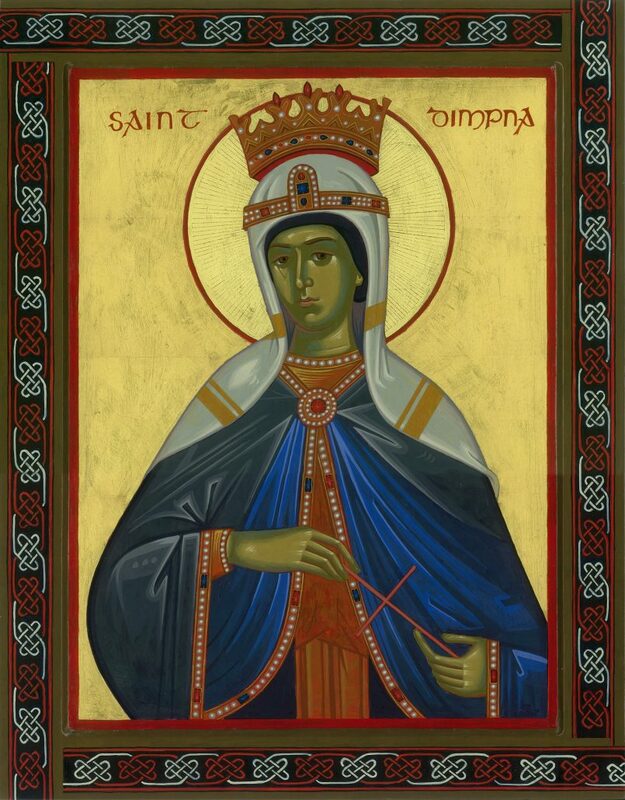 This year we will commence a special devotion to St Dimpna, beginning with a prayer for her intercession at each Mass from Thursday 10th May through to the Feast day. The icon of St Dimpna — blessed by the Archbishop — will be on display within St Patrick’s during those days. For more information contact the parish; email: office@stpatschurchhill.org; phone (02) 9254-9855. Saturday weddings at Saint Patrick’s may be arranged to commence at 9:30am, 2:00pm or 4:00pm. The celebration of the sacrament of Baptism can be arranged through contacting the Parish Office. St Patrick’s offers Masses and Reconciliation on Weekdays, Saturday, Sunday and Public Holidays. Check out our timetable to see Mass and Reconciliation times. Twice a month St Patrick’s Courtyard Coffee Shop provides a guided tour of the St Patrick’s site, where this rich history is outlined in association with the various heritage buildings. Active ministries and groups within St. Patrick’s Parish. Those wishing more information about a group’s activities click here. Alternatively you can contact the Parish Office. At St Patrick’s there is a marvelous tradition of mercy and reconciliation. We will do everything possible to ensure that tradition continues to grow. Statement of Policy on Safeguarding, Click here. PO Box N44, Grosvenor Place 1220.